What is a fun learning toy that is high quality and that my kids will enjoy? It has been a long while since I have done a product review and with Christmas coming up soon, I wanted to review something that would make a great Christmas present. I got these math links I think in January of this year. So far we have loved them and they get a lot of use in our house. I originally bought them to use with the Letter of the Week curriculum from Confessions of a Homeschooler, but I knew I would be able to find other uses for them. Luckily, I was right and they have been a great tool for learning in our home. 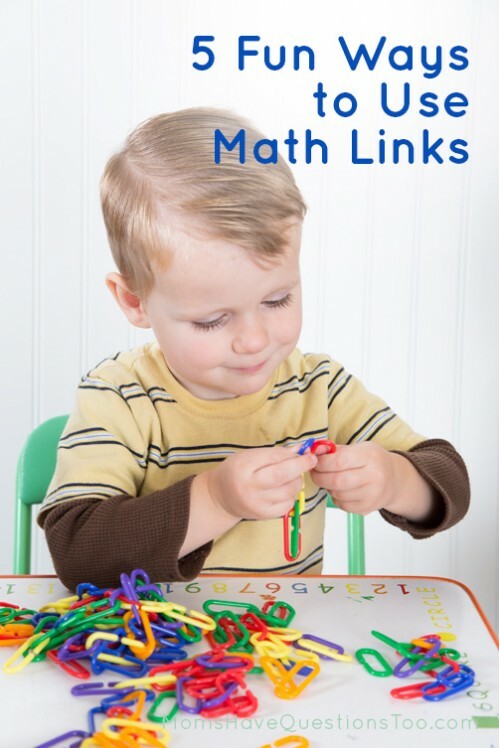 I’ll start with a review of these math links, but I’ll also include 5 fun ways to play with them so be sure to read all the way to the end for lots of math link play ideas. First, I like the container that the math links come in. It is pretty sturdy, but with a lid that can easily be opened by a preschooler. I actually just threw away the container because I started storing a bunch of my learning things in plastic shoe boxes that are all the same size. However, I really appreciated that the container was still in great shape. It could have stored the contents in it for years to come. I love the colors of the math links. They are nice and bright and work great for teaching colors. The exact set of math links I got is no longer available. They now have a smaller set with 500 math links in just four colors (red, yellow, green, and blue). They also have a larger set with 1000 math links in all of the colors of the rainbow (red, orange, yellow, green, blue, and purple). I got a set of 500 in all the colors of the rainbow. Personally, I really like having all of the colors of the rainbow. I used the math links frequently when I was really working on colors with Smiley Man. It was nice to have all 6 colors. However, when I bought mine, I only had to pay $15 because they had all six colors in the 500 link set. So, if a lower price is more important to you, then the four color set is probably a better option. 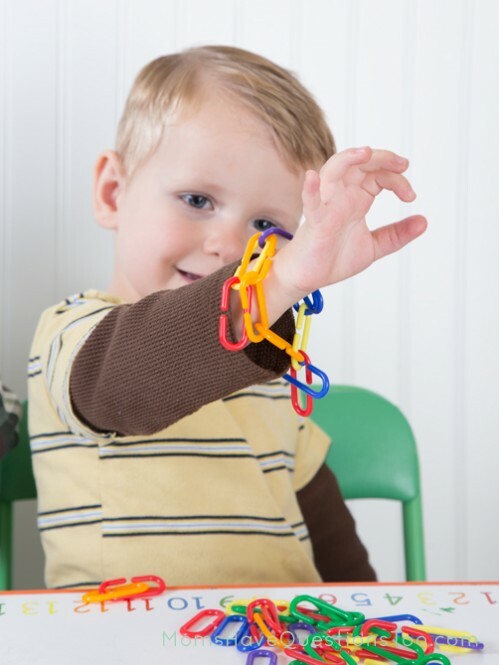 The math links are a good size; they are not too big or too small. The opening is also a good size. It’s big enough to make it easy to put the links together. Smiley Man still has a very difficult time putting the links together, but he almost has it down. It is very easy for Little Bear to put the links together. However, the opening is not so big that the links come out easily and creations fall apart. It’s a great opening size. Also, the links are nice and thick. We haven’t had a single one break so far, but I guess my kids are pretty careful with our learning tools. This was my original purpose for buying these math links. You can find all kinds of number cards to go with different themes on the internet today. I got these awesome pumpkin cards from Confessions of a Homeschooler. I just punched a hole in each card and have Little Bear hook on the correct number of math links. I did a fun measuring activity with Little Bear during our graphing and measuring series. 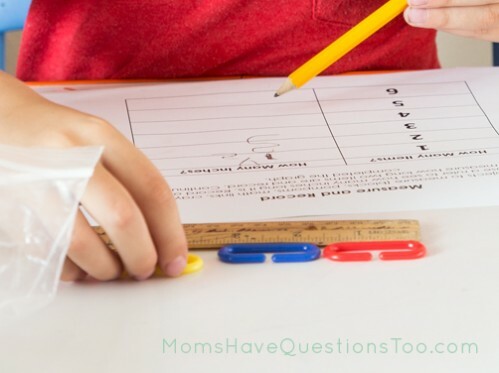 Check out the original post for more information on how to use math links for measuring. 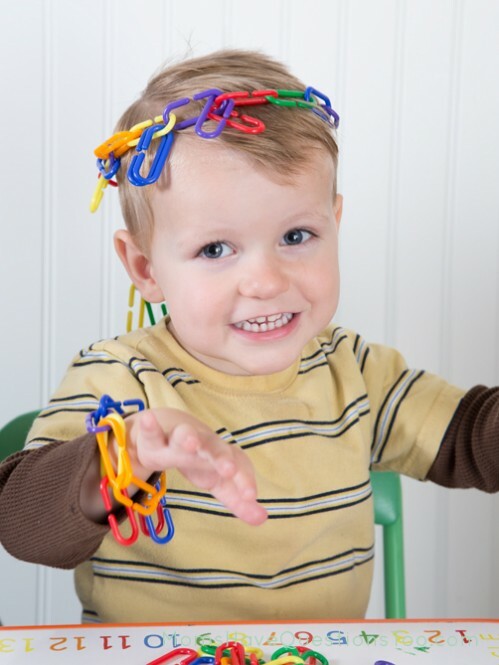 These math links work great for making bracelets, necklaces, and crowns. We usually make crowns because my boys say that necklaces are for girls. Boys, however can be kings so crowns are okay. They also think bracelets are okay, too, for some reason. :) This is probably one of my boys’ favorite things to do with these math links. 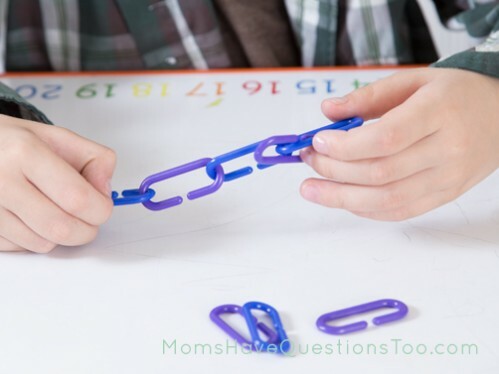 Often I will pull out these math links and my boys will just play with them. They like running their fingers through them, dumping and pouring them, and dropping them one by one on a hard surface. 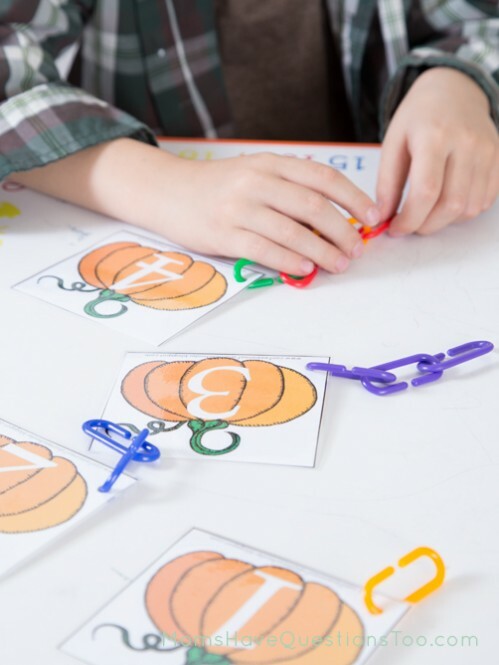 These math links make a great sensory material and are really fun to explore. Also, you can easily make pictures with these math links. Overall, we love these math links and I would definitely recommend them as a great learning tool. We use them a lot for our school time, but they are also really fun just to play with. When I bought them I wouldn’t have thought they would make a good gift for kids, but my kids play with them a lot more than I thought they would. Now I would definitely recommend them as a gift, plus you can sneak all kinds of learning in with them. Bonus! We’ve found some fun people with great linky parties. 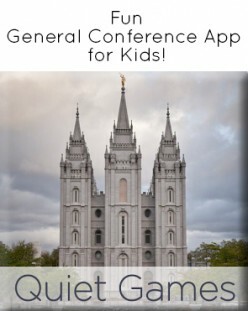 You might just see this post linked up on one of these amazing sites! No Time for Flashcards, Train Up a Child, Teach Beside Me, 1+1+1=1, Living Montessori Now, In Lieu of Preschool, ABC & 123, Sun Scholars, All Our Days, Frogs and Snails and Puppy Dog Tails, Homeschool Creations, 123 Homeschool 4 Me, Teaching Mama. In order for us to bring you great content for free, our blog receives money from ads and affiliate links. These are spread throughout the site. However, the opinions and view expressed on the website are our own.